The initial SF36v2 Health Survey showed the 108 subjects to have a General Health (physical) score of 50.48, and a Mental Health score of 48.79, with a General Population Norm of 50 for both. 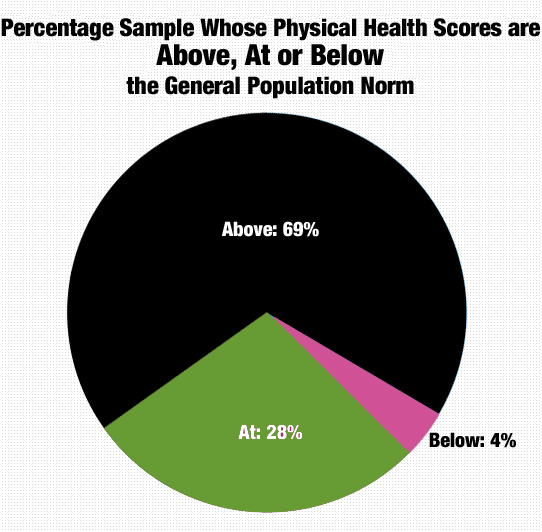 For more about how the General Population Norm and Health Scores are determined, see Appendix . According to the World Health Organization, Australian’s are slightly more physically active and emotionally happier on average than Americans, although we still used the General Population Norm provided as a benchmark in this study. 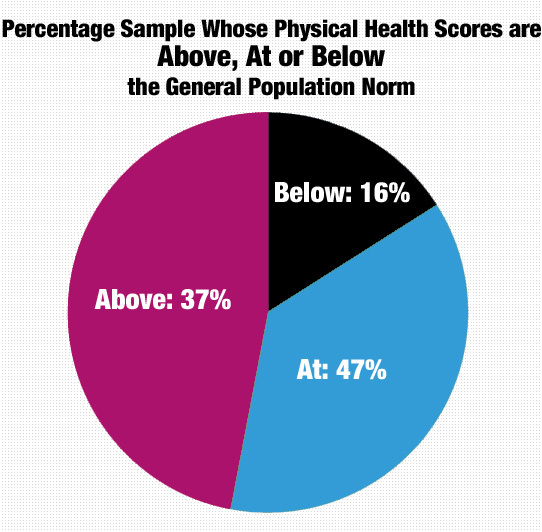 The Physical Health scores are at or slightly above the Norm sample. However, the Mental Health scores are all slightly below the Norm sample. 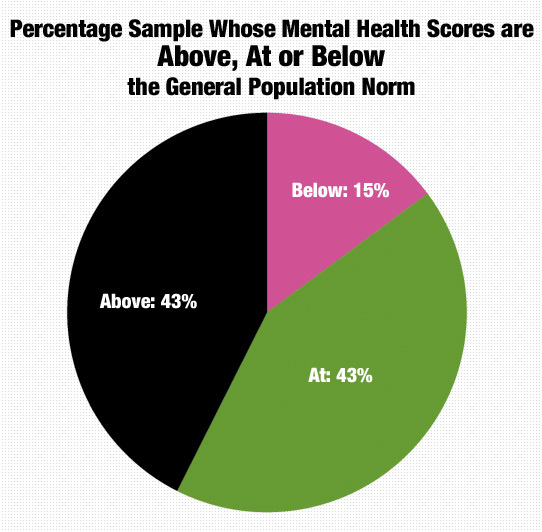 Although the Composite Mental Health Score was only slightly below the Norm sample, it was alarming to see how many of the subjects had a lower Mental Health Score, and the percentage of those who were positive for the first stage of depression. Despite the need for an improvement in mental health, 31% subjects identified being more physically active or “Getting Fit” as their top wellness goal for the program. 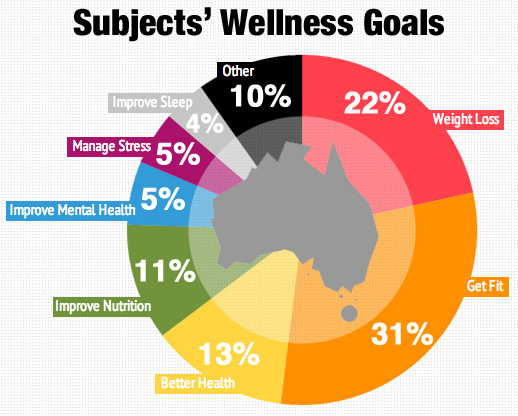 Only 5% of subjects identified managing their stress and 5% identified improving their mental health as their top wellness goals for the program. 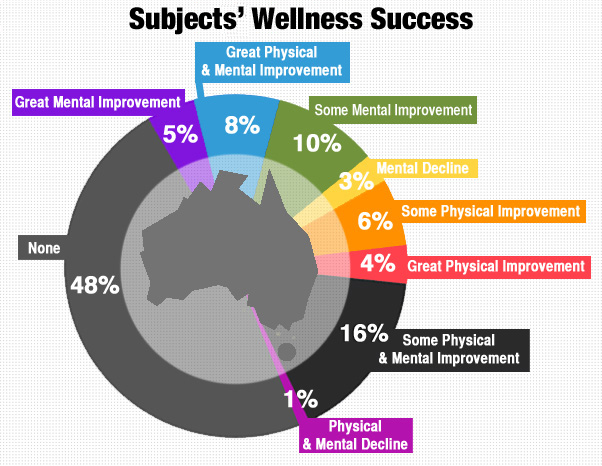 After the 8 week program, only 54 subjects (50% of the original 108 subjects) completed the final Health Survey. Of these 54 subjects, 15 were male (31%) and 33 were female (69%). The mean age was still 41 with an age range of 24-61. The subjects saw a 6.83 point improvement in their General Health (physical) score which became 57.31, and a 4.79 poing improvement in their Mental Health score which became 53.58. Both scores were slightly over the General Population Norm of 50. Of the subjects who completed the 8-week program and final health survey saw considerable gains in their mental health improvement with a significant in first stage depression. However, with half of the participants not completing the final health survey, we cannot accurately determine if the program was successful for most of the subjects. Applying these results to the Motivation, Online, and Social scores that were determined from the data found on the Mapping Social Networks page, we can see that the subjects with higher scored showed greater improvement in their mental and physical health. Each dot in the charts below represent a subject who has made some physical and/or mental health improvement during the program. The shaded lines show the average Motivation, Online & Social Engagement scores fo the subjects who had Mental & Physical Health improvement, Mental Health improvement only, Physical Health improvement only, and no improvement at all. 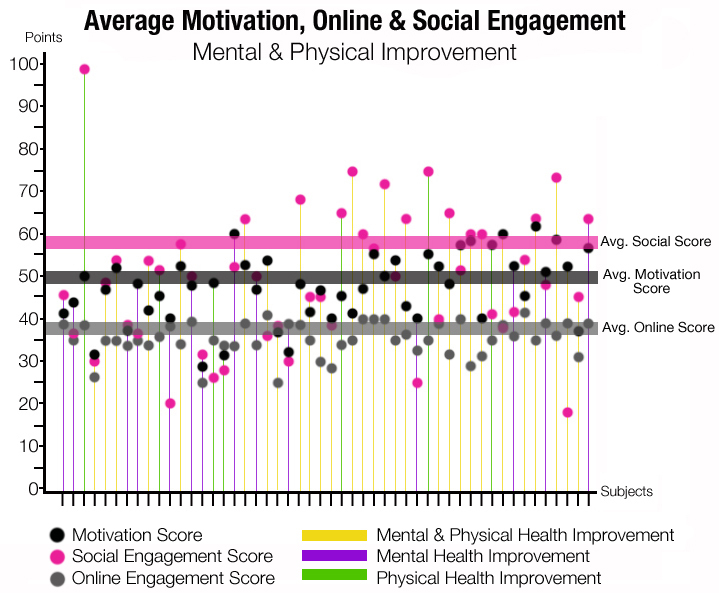 The shaded lines show the average Motivation, Online & Social Engagement of subjects who had improved both their Mental and Physical Health in the program. 18 subjects had some mental or physical improvement, 2 of which had made considerable mental improvement in addition to their physical improvement. It is interesting to note that the two subjects with a significant mental improvement were very different in their scores. One had slightly below average online and motivation scores. The other had an above average online and motivation. Both had below average social scores. 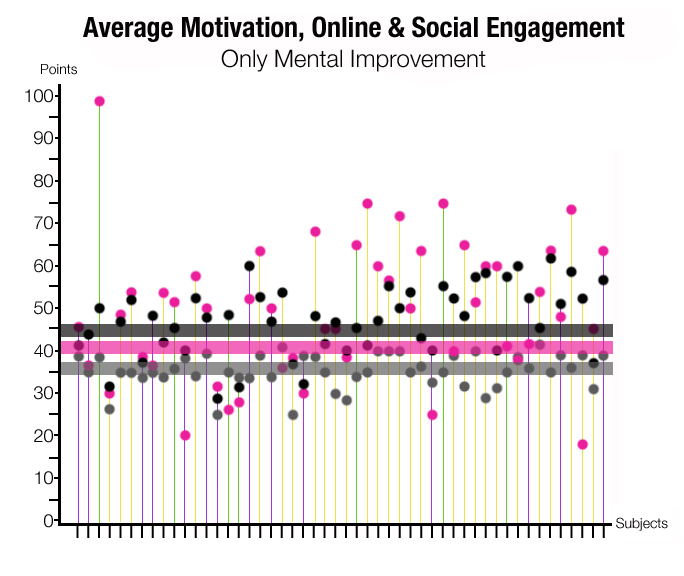 The shaded lines show the average Motivation, Online & Social Engagement of subjects who had improved only their Mental Health in the program. 14 subjects had some mental, but no physical health improvement, 3 of which had considerable mental improvement, and 2 of which had a decrease in physical health. The 3 subjects with considerable improvement had near average online, social, and motivation scores. While the 2 subjects with a physical decline in health, but a mental improvement had average online engagement, and slightly below average social and motivation scores. The shaded lines show the average Motivation, Online & Social Engagement of subjects who had improved only their Physical Health in the program. 7 subjects had some physical, but no mental health improvement. None of which had considerable physical health improvement and 2 of which had a decrease in mental health. The two subjects with a decline in mental health were extremely different. 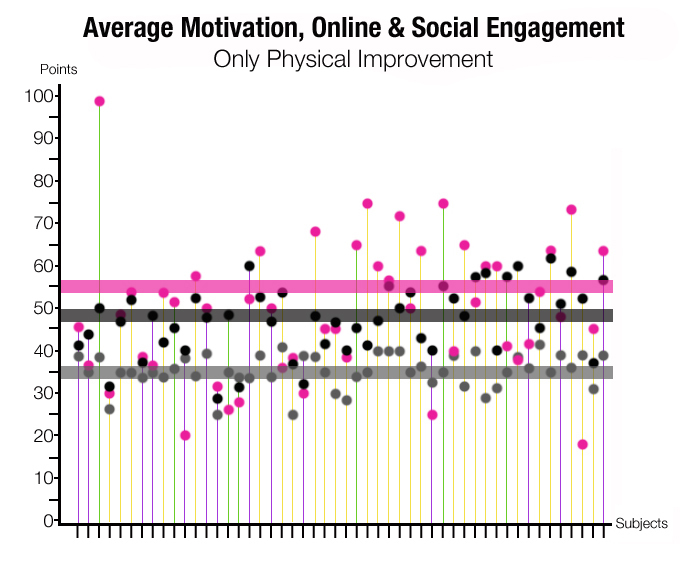 One had a slightly above average motivation and online engagement score, with a very high socializing score. The other subject’s online engagement score was average, while their socializing and motivation scores were slightly below average. In the weekly surveys starting in Week 3, subjects were asked to evaluate how their health behaviors have improved or declined. 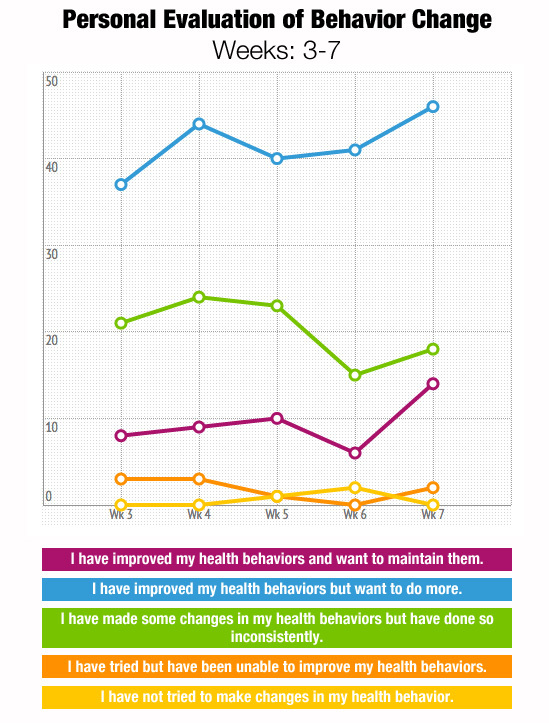 Below is a chart outlining how subjects evaluated the development of wellness behaviors from week to week. Each week, the majority of subjects identified that while they may have improved their health behaviors, there was still more to do. This sense of accomplishment and desire for further improvement is exactly the approach I wanted to convey in my messaging throughout the program and is crucial to creating sustainable behavior change. As outlined on the Literature Review & Theory page, the process of creating new habits and behaviors involves changing or replacing the routine of a habit loop and creating a small reward for that new routine. If subjects feel that they are changing their behaviors and want to do more, then we can assume that they are experiencing enough of a reward from their initial changes to continue. Although it is difficult to determine a clear trend in how the program affected the mental and physical health of the subjects since so many did not complete the final health survey, we can see that a strong portion of the subjects improved their health in some way and showed an interest in continuing to make further improvements to their wellness behaviors.